It is clear that social media or new online advertising isn’t easy for traditional agencies. Recently an adage article came out and basically said the same thing.. What is the effectiveness of online advertising? It is clear that advertisers are more in control and the role of the agency is become less relevant in social media. The new web 2.0 trend is presenting opportunities for new web services platforms to be agencies that replace the middleman agency. I’ve been involved in successful social media campaigns and one consistent observation is that content is very important to influence social networks which in turn creates a ‘conversion’ or social commerce dynamic. Twitter conversations are suggesting that agencies will still be around. Maybe a better title for this post would be: Traditional Ad Agencies are Dying – Make Room for the New Modern Agency. For example GM, Intel, Microsoft, and leading bellweathers in advertising are all doubling down every year online advertising at the expense of other areas like TV and print. 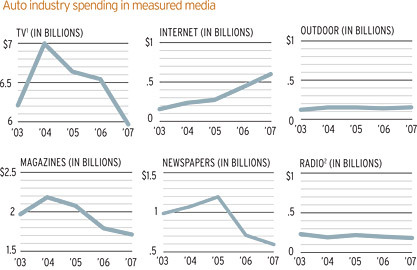 If you believe that TV, print, radio, newspapers are declining then the firms servicing them will disappear. Here is a graph in today’s adage that shows the spend trends in the automotive sector. Author JohnPosted on March 18, 2008 March 18, 2008 Categories social mediaTags auto advertising spend, GM, online advertising, social media, social networks, web 2.02 Comments on Are Ad Agencies Dying?